Usually I like to promote the making of things from scratch around here, but sometimes it’s fun to take a few shortcuts and whip something up easily which gives you that home-baked appeal with shop bought ease. I first saw this idea on Simply Made Kitchen and Crafts, and have since seen it in a couple of other places too. 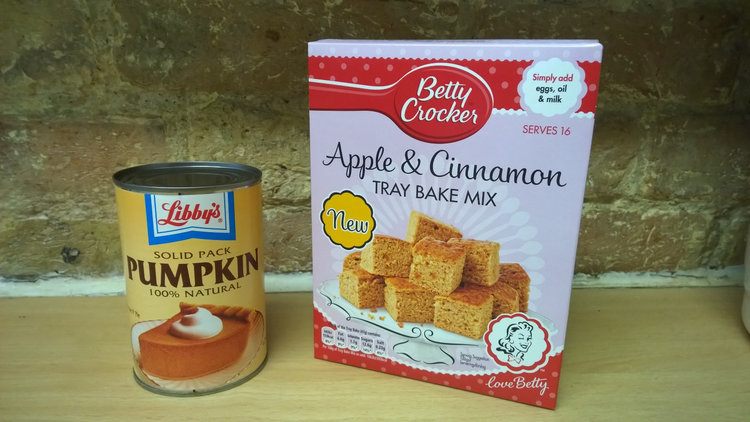 – 1 box cake mix (whatever cake mix you think would go well with pumpkin, you could just go for a simple vanilla cake, but I fancied the look of this Apple & Cinnamon Tray Bake Mix). – A little extra flour (I’ve made these twice with that particular box mix, the first time they were a little TOO moist perhaps, and then I spotted that this mix is only 420g, whereas the other Betty Crocker cake mixes were mainly 450g, so I added some extra flour the second time and they were better). – Some brown sugar or oats to sprinkle on top. 1. Mix the pumpkin into the cake mix. 2. Divide into muffin cases (I divided into 10 cases). 3. If you’re using brown sugar or oats, then sprinkle that on top. 4. Bake at the temperature recommended on the cake box for 15-20 mins until an inserted toothpick comes out clean. Love this recipe. Saw it on Facebook about a year ago. You can use the same recipe and add a whole package of chocolate chips and drop by spoonfuls on a cookie sheet and you get these soft cookies. Yum. They sure smelled good and my grand kids gobbled them up. The cookies are soft and not too flat until I forced them with a fork like peanut butter cookies. I added a cup of chopped walnuts too, to both the muffins and the cookies. Wish I could post you some muffins, but don’t think they’d survive the trip! Yes, in the UK however canned pumpkin is quite a new ingredient, it’s not something that most people over here will have used, so I wonder if it’s only available seasonally for now. I’m fanatical over pumpkin. This looks awesome! Yes, my childhood and early adulthood was pumpkin-deprived, it wasn’t till I lived in the states that I really discovered it, so now I’m making up for it! I work for Twin Pines Landscaping, and we are putting together a bunch of our favorite Thanksgiving recipes featuring fruits and veggies to share on our social media accounts! 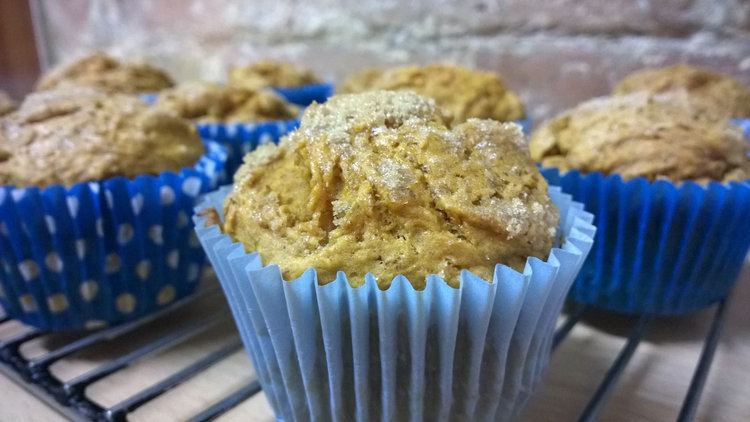 With your permission, we’d love to share your picture and link to the recipe here on your blog! Let us know what you think! Thanks, and Happy Almost Thanksgiving! Hi Ashley – yes, very happy for you to share it! And Happy Almost Thanksgiving to you too! Thank you so much for your contribution! You can see the final post on our Facebook page here http://on.fb.me/1teOexS. Remember to “Like” Twin Pines on Facebook, and share the post/album with your friends! Then check back next week to see how we can tie all these recipes in with landscaping! Thanks again! Sometimes, you just can’t beat ease of preparation, especially at busy times of the year. 🙂 My husband’s the big pumpkin fan in our family, and I bet he’d love these! Yes, even these short-cut methods still often taste better than bought stuff, and you get the lovely aromas as they cook! i didn’t even know you could eat pumpkins until recently – I thought they were just halloween decorations. What a waste to use them at halloween and then not eat them! … bah humbug …. !